Live blog on RTÉ.ie and the RTÉ NewsNow App 12.30pm. Live commentaries and updates on RTÉ Radio 1's Sunday Sport from 2pm. 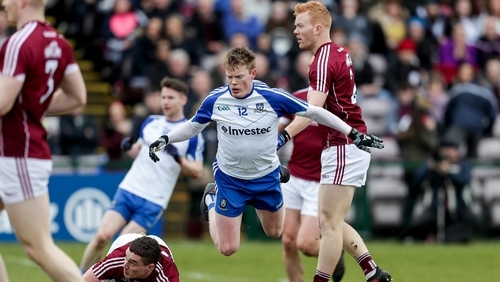 Monaghan v Galway live on TG4 from 1.30pm. Deferred showing of Roscommon v Tyrone from 3.45pm and Clare v Cork from 5.15pm on TG4. Highlights of all the weekend's action on Allianz League Sunday on RTÉ2 and the RTÉ Player on Sunday, 9.30pm. Cold and bright with occasional showers and gusty westerly winds. More general showery rain and sleet will spread southwards from Ulster during the afternoon and evening. Highs of 5 to 8 degrees. For more go to met.ie. For the third straight game, Conor McManus will be kept in reserve as Monaghan look to bounce back from last week's defeat away to Roscommon. Drew Wylie, Neil McAdam and Ryan McAnespie all return for the visit of Galway while rising star Stephen O'Hanlon will sit this one out after getting a straight red at the Hyde. The Tribesemen really fell flat in the second half at Croker last weekend and with Seán Andy O Ceallaigh and Cillian McDaid unavailable, the absentee list is starting to lengthen. Kevin Walsh's main focus, however, is on the summer campaign but staying in the top tier should also be a priority. "The majority of games so far have been decided by a single score. That stat illuminates a reality that these seven rounds of league football are the most compelling and entertaining games of the inter-county year. "By a process of natural selection, every team is where they deserve to be in the hierarchy at the start of each season. The virtue of that fact is that everyone around you are in similar positions and, crucially, beatable." Turlough O'Brien's men lead the way on points difference in Division 3 and host Longford at Netwatch Cullen Park. With Longford still short the Mullinalaghta contingent, you'd fancy the Barrowsiders to maintain their promotion push. This third tier, like all the divisions is a competitive beast, and the most surprising result in the last round was Louth defeating Laois. The Wee County were seen by many as the most vulnerable in the section but another two points against Offaly in Tullamore would go some of the way to ensuring safety.